Daddy is a "meat person", I'm a veggie lover. I always try to cook some meaty dish for him but recently ran out of idea. Then I thought why not cook a simple braised some-kinda-meat dish. 1. Marinate the pork belly with 1 teaspoon soya sauce, 1 teaspoon oyster sauce, 1 teaspoon dark soya sauce, 1 teaspoon sugar. 2. Allow this to stand at room temperature for at least half an hour. 4. Add the remaining soya sauces, oyster sauce, honey, sugar into the 2 cups of hot water. Stir till everything is dissolved. 5. Add the star anise, cinnamon, garlic and galangal into the pot. 6. Turn up the heat to high, add the dark liquid mixture into the pot and allow this to come to a boil. 7. Add the sliced pork pieces in. You can add in any other ingredients that you like, such as egg or tua pok (u get the idea). I added a piece of defrozed tofu, cut into small cubes. 8. Once the sauce begins to boil again, lower the heat to a simmer, and allow this to simmer for about two hours, with the lid on. 9. Taste the gravy, if it add more sugar or salt if needed. I served it at tonight's dinner, daddy was very happy, says its tasty. Even Little DinoEgg love the pork belly. Daddy's colleague taught us this when we invite them over for steamboat. She says to put the tofu into the freezer, later on take it out n defroze it. When u cut it, you can see that there are alot of "air pockets" inside the tofu. When you throw it into the soup, the tofu will absorb the soup like a tau pok, when you bite into it, the taste will be different. Its really very tasty when we had it during the steamboat so I thought I'd add it into the braised pork belly dish too. 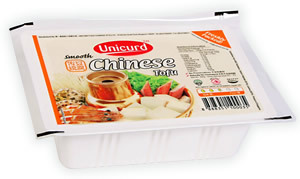 I like to use Unicurd's tofu, its very smooth n soft, taste good even if u just put them into the soup.